During the 1940s when World War II was at its peak and many cities were suffering bombing raids the Government decided that many city children should be evacuated to safer areas of the country which were not targeted at that time. Many children from the Midlands and London arrived in Wales and spent the remainder of the war years locally. Many came to Hirwaun and were organised by the local branches of the W.V.S. Civil Defence. There were two branches of the W.V.S. in Hirwaun, one on the Breconshire side and one on the Glamorgan side, who arranged the reception and refreshments for the children after their long journeys. Mrs. B. Pearce and Mrs. Gregory were in charge of the Breconshire side and Miss Godfrey, the local school Headmistress, and Miss Williams were in charge of the Glamorganshire area. 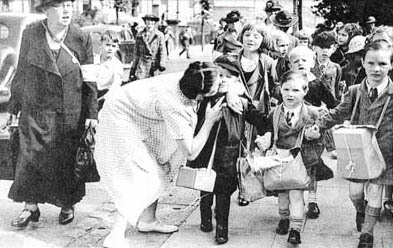 A sad parting as the evacuees leave their parents and their London homes. The Breconshire W.V.S. lasted the whole of the war and a few years afterwards and meetings were held on Thursday afternoons in the vestry of the English Weslyan Chapel. The members did a great deal of knitting for the troops and were connected to the Red Cross and SAAFA Association who would let them know what items of clothing were needed most, they provided the wool for soldiers balaclavas, mittens/gloves, socks and scarves – the wool being the appropriate colour for each service, i.e. Khaki, Navy Blue or Air Force blue, hundreds of items were completed for servicemen’s comfort. Many members did street collections for National Savings – the stamps being six pence each (old money – 2.5p in new money). Many of the ladies had someone in the armed forces and did everything they could do to help. The main task was receiving the children when they started to arrive and that took place in the English Weslyan chapel or Nebo Chapel. It was a sad sight to see the crocodile of little children coming down from the Hirwaun Station carrying their belongings and looking very anxious. I was taken along to these events by my mother who was a member of the Breconshire branch, and had to sit qulet lv in the vestry while the children were seated in the main chapel waiting to be collected. We never knew the sad stories behind their arrival, it must have been an ordeal for those children waiting to be picked by villagers who were complete strangers – many adults were speaking a strange language as well – Welsh, and many little ones cried a lot. (A lucky few had their mothers with them who were accomodated for a few days before leaving the children with their carers.) They had had very long journeys, seemed to be wearing a lot of clothes – all they could put on, had name tags and boxes hanging around their necks containing ‘gas masks’ and brown paper parcels containing their spare clothes. Collections of clothes were made by the W.V.S. ladies and it was an exchange system as no-one had ‘coupons’ or spare money for extra clothing for these families. We never knew who was coming to our house. Our family had both Birmingham and London children, our friendship with the ‘Brunmmies’ lasting to this day. It would be good to hear other people’s recollections of the War years. In 1956 Queen Elizabeth became Patron of the WVS and ten years later in 1966 awarded Royal to their Badge for all that they had achieved.